‘Bluefield Houseboats’ based in Lisburn Castlereagh City has been making waves both locally and internationally with their range of energy efficient luxury houseboats. Offering a wide range of floating structures, the houseboat can be used alone, or in modular fashion to create new areas of public realm, housing and commercial spaces. 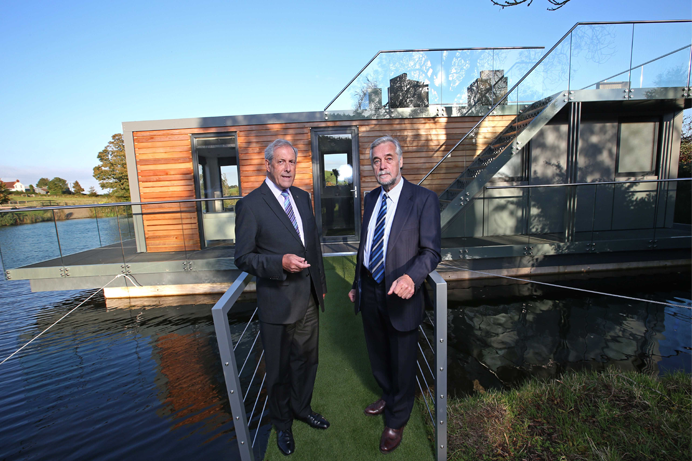 ​Joining forces with Lisburn & Castlereagh City Council, Bluefield Houseboats launched their exciting and innovative property option at the UK’s largest property exhibition, MIPIM UK. Chairman of Bluefield Houseboats, Tony Reid, explains: “Bluefield Houseboats is the only houseboat manufacturer to comply with both Building Control and Maritime & Coastguard Agency regulations. This offers an extra level of security to their product which is manufactured from high quality materials with a minimum 50 year design life. The bespoke houseboats abide by the classifications for both a land-based building and a water-based vessel. To minimize energy usage, the homes incorporate passive design principles to take advantage of natural heating, cooling, and ventilation. A SMART home automation system gives the owner control over energy usage, from appliances to light switches, using a smartphone or tablet. Bluefield Houseboats was keen to set up in the Lisburn Castlereagh City area due to the low rates, reduced operational costs including transportation, the skilled workforce and available investment support. Lisburn & Castlereagh City Council can offer a bespoke tailored package of support to inward investors or those businesses who want to relocate to the area. If you are interested to hear more about the Lisburn Castlereagh City area and Bluefield Houseboats please visit Lisburn & Castlereagh City Council at stand E14, MIPIM UK or tweet to @invest_LCCC and follow #LCCC_RightCombination.